A dog house is a perfect summer project so your favorite pet will be protected from the elements this winter. It should not be too big or too small for the intended dog because of the potential for excessive heat loss or constriction. Browse through the free plans below to find a perfect house for your dog. You can give your dog a haven from the weather that also matches your house.Built for a medium size to large dog, this house is roomy. 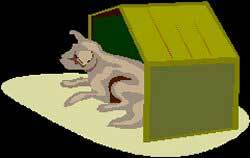 Build a two-room kennel that provides a warm, dry, outdoor shelter. One room is outdoors and the other indoors; the outside room is half as large as the inside room. The roof can be built where it's detachable too. 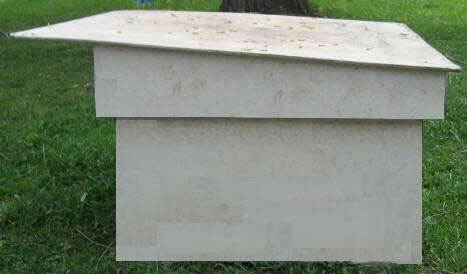 Here is a dog house that is designed for a medium size dog. Providing sturdy shelter with the use of pressured treated wood for the walls and roof. A installed rear vent can be added to this dog house for extra ventilation. Dogs love a warm, dry, comfortable dog house. Here is a plan for a dog house that is all the above plus easy to clean. Built with a removable top for easy access and insulated for warmth for those cold winter days & nights. 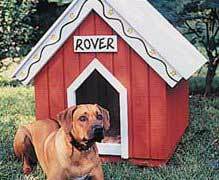 Provide your best friend a great dog house with this free plan. This is a dog house that will accommodate a large dog but is still suitable for smaller dogs. This dog house looks great in the back yard and helps keep your pet happy and healthy. Plan calls for treated & untreated lumber for this shelter.